All of us knew how much these operating rooms were needed, and how important they were for advancing Israeli medicine and affirming the leadership of the Hadassah Medical Organization in healing, teaching and research. We look back with admiration and for inspiration to our past generations of leaders who built the hospital on Mount Scopus despite the Great Depression. In turn, they looked back on those who, with our first President Henrietta Szold, founded Hadassah and established the Nursing School, Tipat Halav, and our first hospital on the Street of the Prophets. Each generation has its own challenges and we have had ours. And yet, we’ve made it to this day thanks to our Hadassah members, Associates and Donors from New York to Hawaii, from Melbourne to Mexico City, from London, Paris, Berlin and here in Israel. The operating rooms are the most modern in the region and exemplify the type of medicine we anticipated HMO practicing when we built the Sarah Wetsman Davidson Hospital Tower. Just as new standards were set above ground, the underground facility we dedicate today will expand the limits of our accomplishments for patients needing surgery – – be they Israelis or those seeking our expertise from beyond our borders. 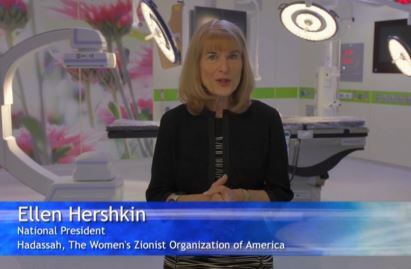 I am Ellen Hershkin, the 26th National President of Hadassah, not yet two weeks on the job. The Hadassah Medical Organization has a new incoming Director General. With the government of Israel, Kulanu B’Yachad, we will work together for a single purpose: to maximize the contributions of Hadassah Medical Organization to the People of Israel – – and ultimately, the world. We have a superb Staff of talented men and women – – the best in the world – – to accomplish this goal. We rejoice today, while simultaneously looking toward the future. We realize the urgent need to move the Internal Medicine Departments in to The Tower. Therefore, in the name of our 330,000 members, Associates, donors and international supporters, we are about to advance the funds to do so. We enter the new gates of healing with thanksgiving. I close with blessings from our partners around the world, the men and women who stand with you fulfilling Henrietta Szold’s imperative to “Dream Big”. Thanks to all. Toda le’kulam. To listen to and watch Ellen Hershkin’s speech, please click here.